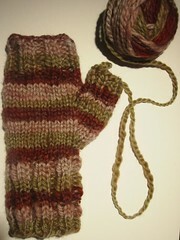 the yardage on the pattern said 80, but i guess that must be per mitten. there was 177 yards of this bfl when it came off the wheel (before washing and dyeing) but the one mitt took 5-and-a-little-bit colour repeats and i only have 3 left. i didn’t swatch since it was easy enough to try as i went along and it’s bang on size-wise. i’m in a quandry what to do next: spin some extra and try to approximate one of the colours then use that for the cuffs? spin some extra and dye to a co-ordinating colour then intersperse that as another stripe? spin some extra don’t even bother to frog the first and just have them unmatch? just do something different with the yarn? i do love the mitten though, fits perfectly (apart from over-tight cast-off, obviously) and is super cosy and soft. 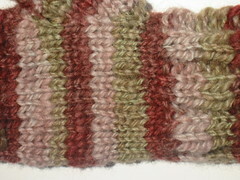 the pattern was great, really easy to follow, and i learned how to make 2 stitches together. wasn’t sure what “reverse loop” was so did “knit left loop then knit right loop” as per knitting help. also learned how to pick up stitches around the thumb which worked out really well with no gaps (once again yay for kh). the self striping was a cinch too. i just wrapped the yarn around 2 chair backs the length of our front room apart to make a really long skein. then i marked it into 3 with yarn and each third went into it’s own bowl of dye in the massive pot. the only tricky thing was handling a skein that length, especially for rinsing, but in the end i just hauled it of all the bowls and dumped into the sink (handily enough our front room isn’t exactly huge, so the skein was just about manageable). the thing i liked best about all this is that it didn’t take much longer to do than it did to write up. it was fluff at lunchtime and knitted before bed.